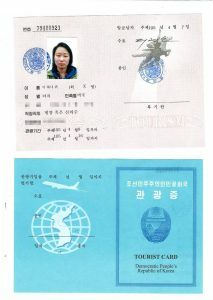 The visa I received to visit North Korea as an American tourist. Three weeks later, I received a copy of my North Korean visa. The trip was on. In early April, I flew from New York City to Beijing. From there, I boarded a North Korean owned Air Koryo plane headed for the capital city of Pyongyang. Our only on-board entertainment was a Moranbong Band concert, which played on the overhead speakers. 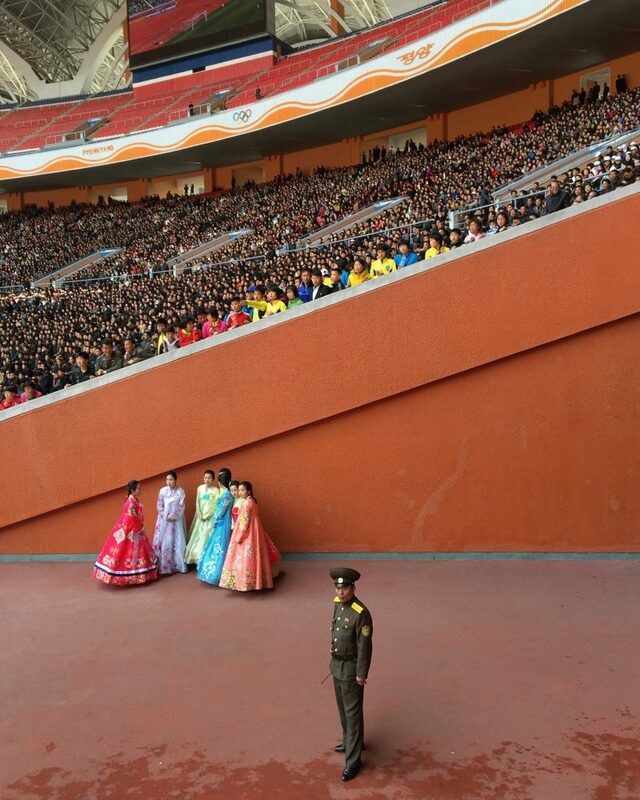 Moranbong Band is the country’s popular all-female performance group, whose members are chosen by leader Kim Jong Un. Throughout the two-hour flight, the women played electric violins and drums while singing songs about their great leader and country. It was our first taste of what was to come. In total, I spent seven days in the country with nine other Americans, shepherded by two female minders. One of the group’s many tour guides is seen here in Nampo, North Korea. Photo by Hannah Yi. Our days were packed with visits to monuments, museums, schools and factories. 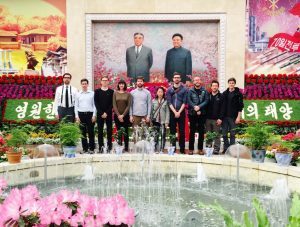 I quickly learned – as perhaps I might have expected – there is no such thing as a self-guided tour in North Korea. Each destination came with an assigned guide who would begin by rattling off strings of statistics. He or she would point to the height of a statue (super tall! ), the size of a facility (really big! ), the number of computers (so many!). Each guide would then launch into a speech about the wisdom and benevolence of the supreme leaders who make all things possible. Workers start the day under a banner that reads “Self Reliance” at the Chollima Steel Complex just outside the city of Pyongyang. Photo by Hannah Yi. The destinations chosen for us felt like the country’s attempt to prove North Korean prosperity and self-reliance. People here have “nothing to envy” — a common propaganda phrase. Most tours would end with a trip to a so-called “guest room.” These were sparse spaces with couches and coffee tables. The guide would point to the leather bound books on the tables and ask us to share thoughts on what we had just seen. During these exchanges, many of us would simply sit politely. Others wrote carefully-worded pleasantries as our minders looked on over our shoulders. Bronze statues of the former leaders loom 22 meters high at the Mansudae Grand Monument. Photo by Hannah Yi. Pyongyang is undoubtedly a surreal place. 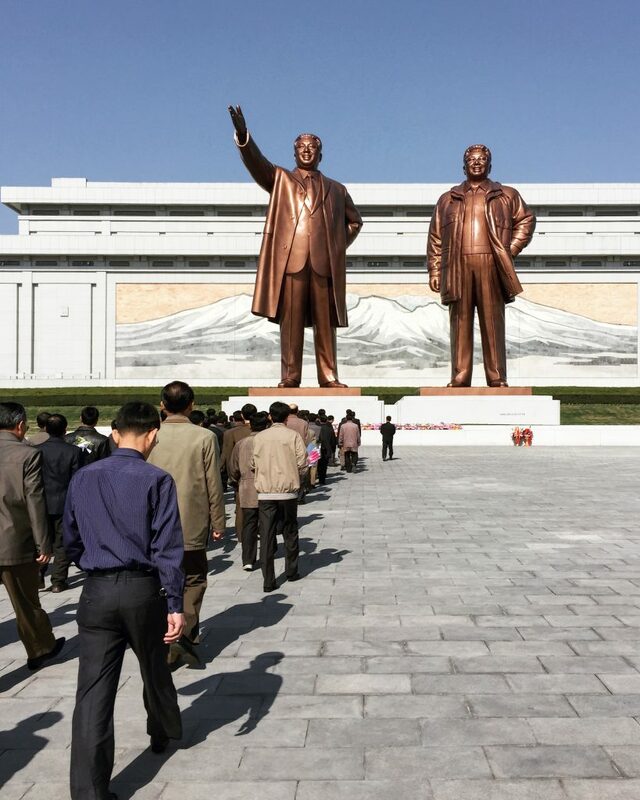 There are huge portraits and towering statues of Kim Il Sung and Kim Jong Il everywhere. People speak their names constantly. In the country’s capital, I saw people both cry and applaud when speaking of their leaders past and present. As if on cue, many of the North Koreans we were introduced to launched into a speech exalting the leaders. After this initial exchange, however, I was sometimes able to glean what felt like more authentic moments because I speak Korean. They were curious about my parents, my age, or whether I was married. 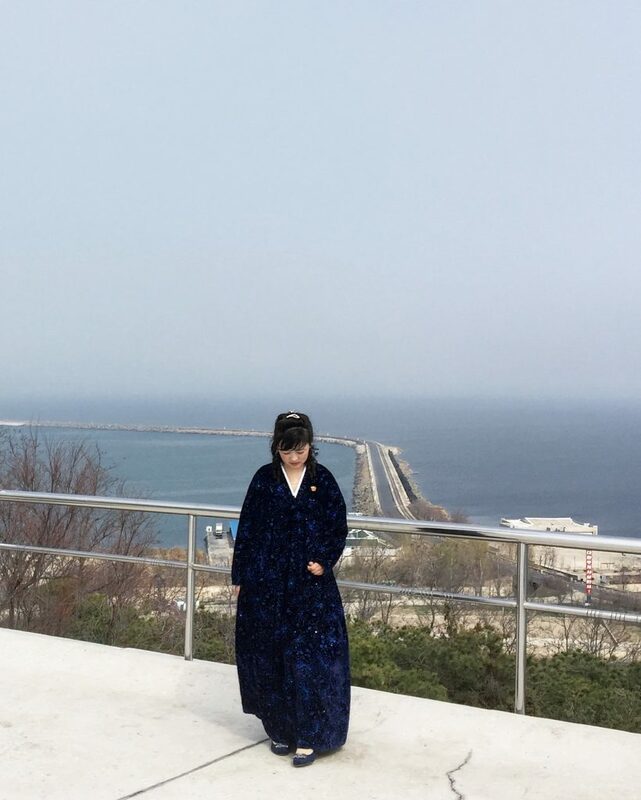 They loved seeing photos of my family, especially the one where my mother is wearing a traditional Korean dress similar to the clothing women wear in North Korea. While the conversation did not always flow smoothly because of our accents or I did not know the right words — we could communicate well enough. A crowd watches a soccer game at the Rungrado 1st of May stadium in Pyongyang. Photo by Hannah Yi. In one moment that stands out, a waitress was so relieved that I could speak Korean and order food for the group that she came by multiple times to thank me, offering more water and vegetables. During one long drive into the countryside of Pyongyang, one of our minders shyly asked me if I had a cookbook with me. She was interested in making new dishes – especially pasta for her son – but had nowhere to get recipes. I tried to share a simple dish from memory, but soon realized she had no access to one ingredient we take for granted: paprika. On our last night in Pyongyang, we went to see fireworks in the city center. 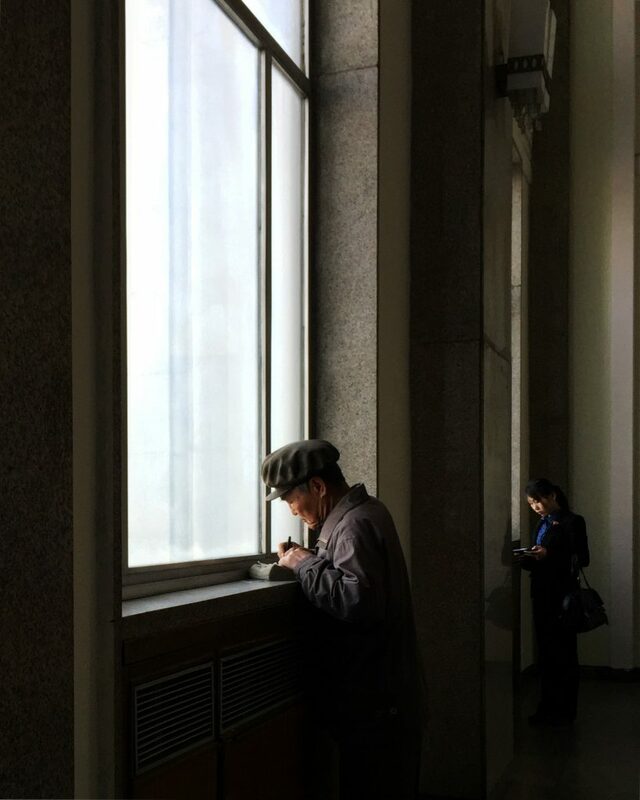 Our group was huddled among North Korean citizens young and old. She looked at me confused, as if only then realizing I was a foreigner. After a moment of puzzlement, she quickly smiled at me, and I smiled back. These random and simple moments were what I found most memorable. Perhaps because we were watched so closely and our schedule was heavily curated, I found myself drawn to photographing the “normal” moments of daily life in the secluded country. 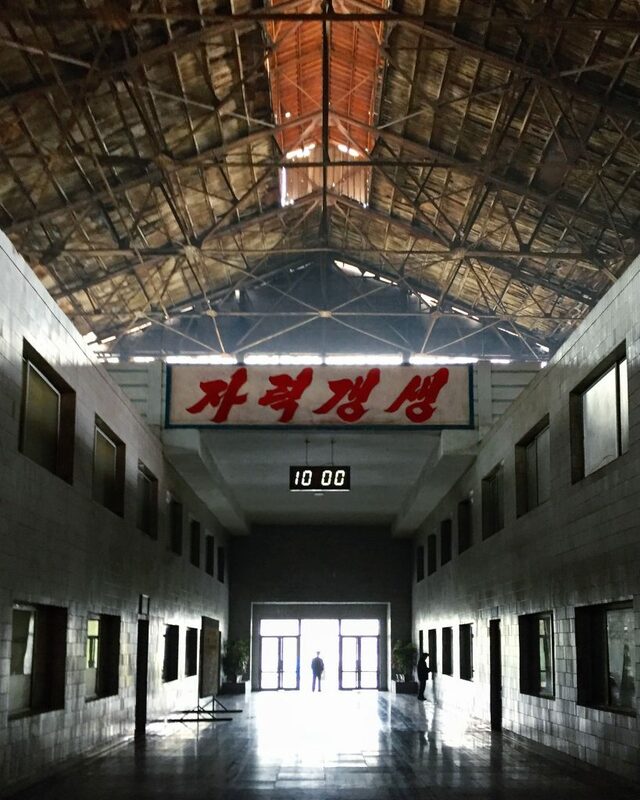 See more of Hannah Yi’s photographs from North Korea on Instagram. The Grand People’s Study House in Pyongyang where people can take classes and checkout books. Photo by Hannah Yi. 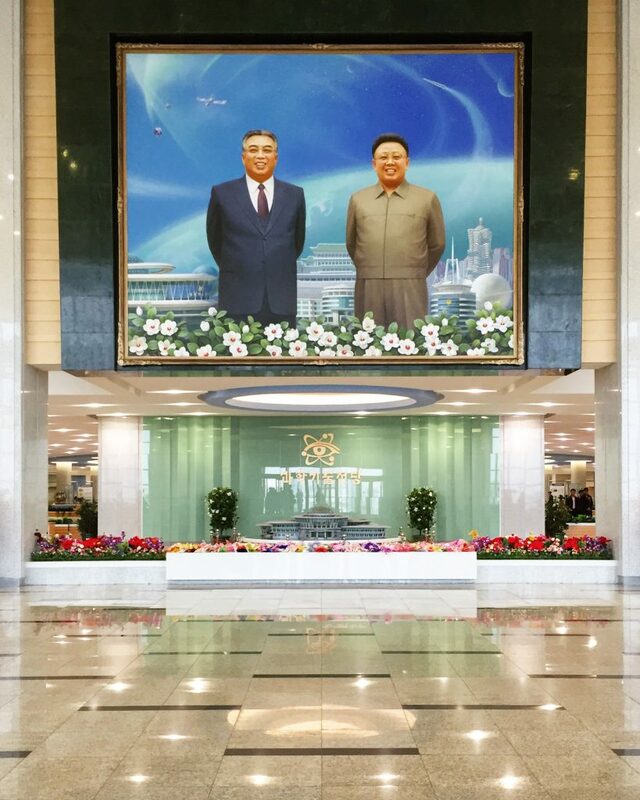 Visitors to North Korea are often welcomed by large portraits of the two former leaders, like this one seen at the Science and Technology Center in Pyongyang. Photo by Hannah Yi. 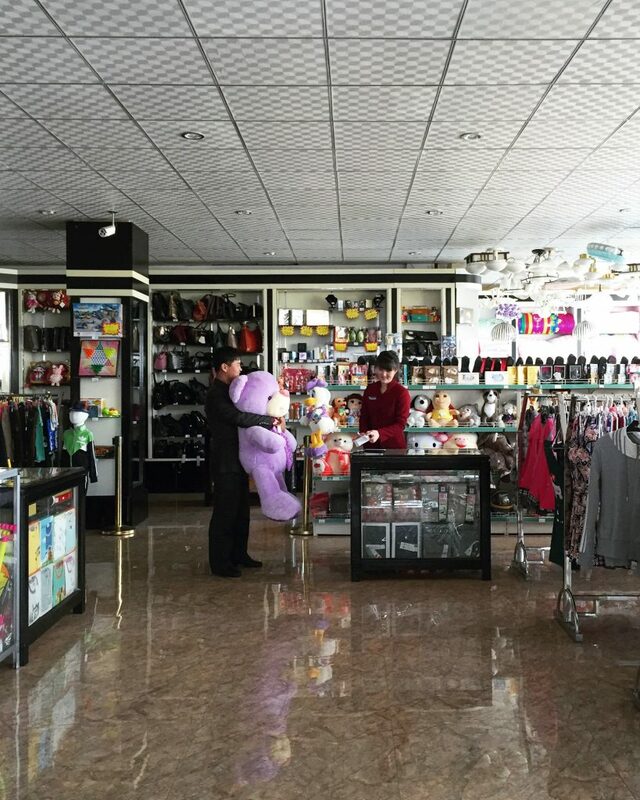 Employees are seen at a department store in Pyongyang. Photo by Hannah Yi. 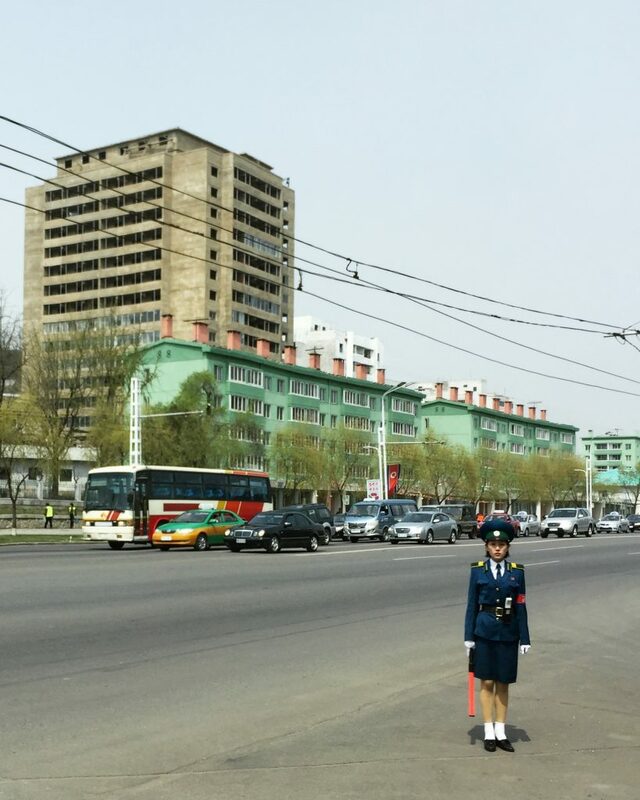 A female traffic cop is seen here in Pyongyang. Photo by Hannah Yi. 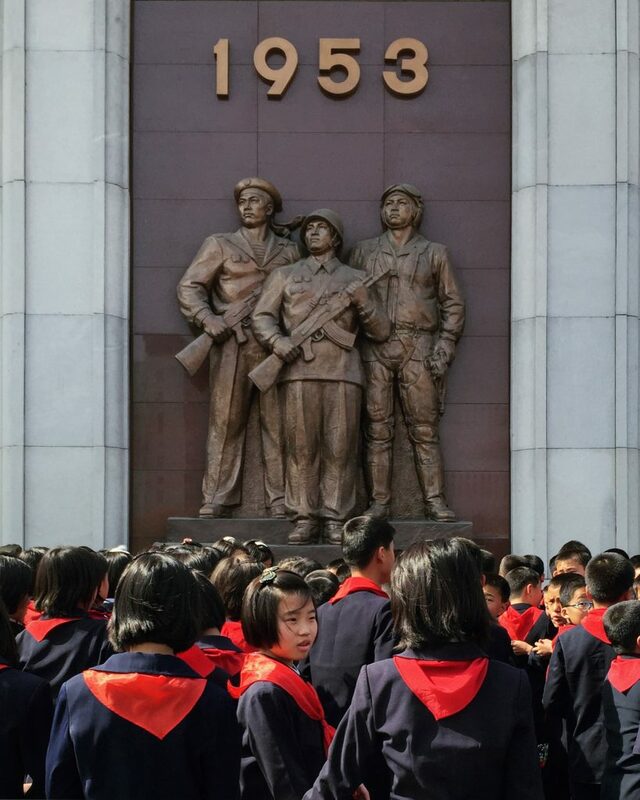 Students are seen here at the Victorious Fatherland Liberation War Museum in Pyongyang. Photo by Hannah Yi. 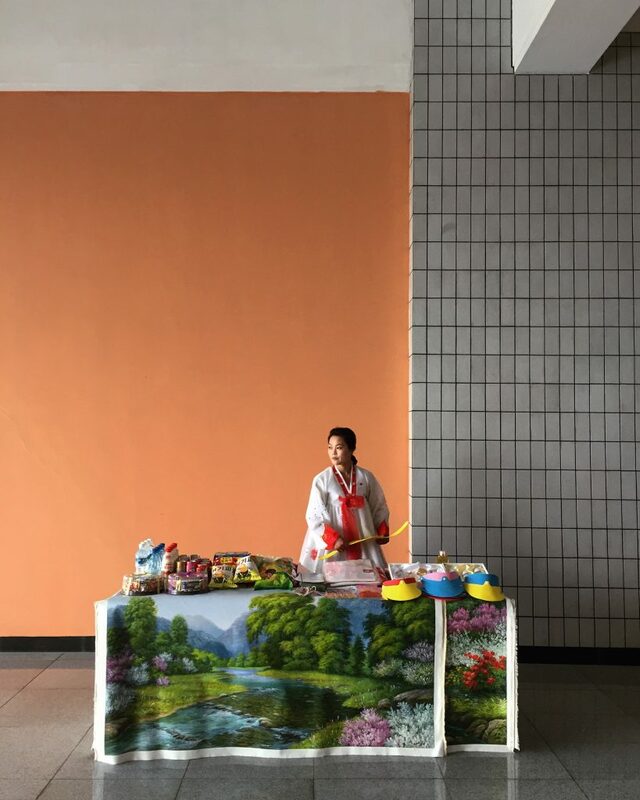 A woman sells souvenirs during a soccer game at the Rungrado 1st of May Stadium in Pyongyang. 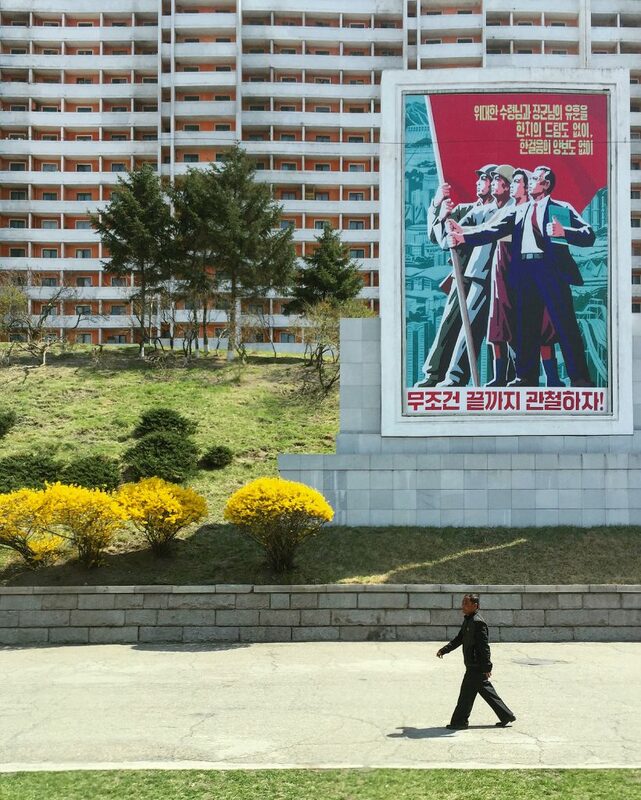 A man is seen walking under one of the many propaganda signs that hang on the streets of Pyongyang. Photo by Hannah Yi. Left: Hannah Yi (center) is shown here with her tour group. Photo courtesy Hannah Yi.